Wooden molding is generally a strip of designed wood used to decorate ceilings and wall-ends. It is a decorative item and generally completes a structure besides giving it an exquisite look. 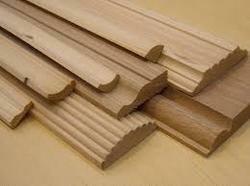 We offer a unique range of wood molding available in various designs of multiple species. If you wish to give your ceilings and building floor an elegant look try our Wood molding, and we guarantee you will be contented and happy.